Yes, the headline is intended to mimic the “MJ Being MJ” headline from last week when Michael Jordan took to Twitter to show his competitive nature is still alive and well. 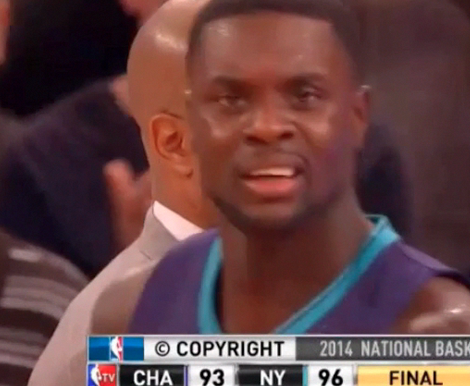 Charlotte Hornets guard Lance Stephenson was at his antics again last night when he video bombing new New York Knicks head coach Derek Fisher after a 96-93 Knickerbocker win. This video bomb has turned into a video meme that has taken over the Internet over the past day. These memes are almost as funny as all of the memes people made after Lance blew in LeBron James’ ear during the Eastern Conference Finals last year. Take a moment to watch the infamous ear blow and notice LeBron’s face once he realizes what the heck just happened. The King’s reaction is priceless and still very funny. I think I speak for all of us when I say I cannot wait to see what Lance has in store for us next. This entry was posted in 14-15 Regular Season, Home, NBA and tagged Charlotte Hornets, Derek Fisher, ear blow, Lance Stephenson, LeBron James, Michael Jordan, MJ, NBA, New York Knicks, video bomb, ZML, Zocco's Modern Life. Bookmark the permalink. ← A Series to Remember?